Bonfire Heart is a great song to learn, if you want to take your fingerpicking skills to the next level. While the fingerstyle sections of this tutorial is aimed at intermediate guitarists, beginners can start by learning the chords and strumming them along with the song. We’ll start our Bonfire Heart guitar lesson by learning all of the chords to the song. We’ll learn the intro, verse, chorus, and the bridge. Some tablature sites will have a pre-chorus section as well, but I just include that in the verse section. The song is played in the key of G, so we’ll have chords revolving around this key. 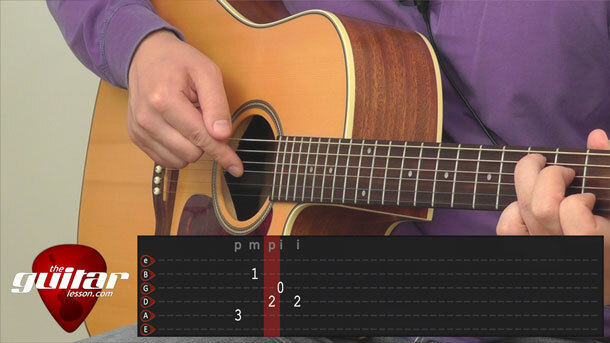 Once you are comfortable with the chords, we’ll learn the picking pattern to Bonfire Heart. This is where things start getting really interesting, since we’ll be learning a very unusual picking pattern that sounds great in this song. I’ll tell you all about it in the lesson. You will have to practice this picking pattern quite a bit to get the timing and rhythm right. When you add the chord changes of the verse and chorus, it becomes even more difficult. The reason I’m saying this is that you should know this one isn’t a “learn in 1 day song”. In fact, it will probably take a while before you perfect all of the elements of the song, and be able to play it up to speed with the original track. Keep it slow at first, make sure your fingers are precise, and your chord changes are spot on. Increase your speed once you can play everything smoothly. This is how you will really advance, and trust me, if you learn to play this song well, your fingerpicking skills will have advanced leaps and bounds. Bonfire Heart was released by James Blunt on his 2013 album Moon Landing. "The song is about love, life, fear and hope," said the singer. The music video was shot throughout Wyoming and Idaho over two days using real characters. In fact, the closing scene wasn’t planned at all. There was a real wedding taking place at the bar of the parking lot where they were filming, and the wedding crowd came out and joined Blunt’s video ad-hoc. The song topped the charts in several countries, including Austria, Germany and Switzerland. Sorry, but you've reached a premium content area. The download of the Bonfire Heart tablature file is only available to premium members. Sorry, the same goes for the backing track. To download the backing track to Bonfire Heart, please log in and revisit this page.